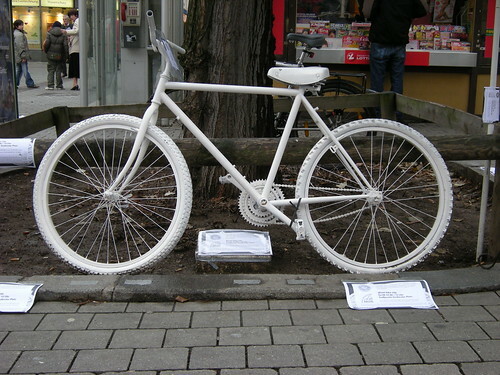 The all-white "ghost bike memorials" are a familiar sight in urban areas around the world. Simple, effective and profound. But in Tuscon, a team of local students and an interactive display company have translated the vocabulary of these pop-up memorials into something more permanent without losing the spontaneity and sincerity of the originals. The memorial chapel was designed by local students. Creative Machines, a fascinating Tuscon-based interactive display design and fabrication company which also produces public art installations, led the project and provided fabrication expertise. Like all memorials, the Bike Church approaches the condition of art more than other works of an architectural scale. But in this case in particular, the language of the art draws from and speaks of primal architectural assumptions and forms. This may be as close to a folk art installation as we will ever find. What does it, therefore, say about cultural assumptions of memorial and church which an institutional mainstream church building could not? What minimum of symbolic and formal elements are necessary to understand this structure as church? For I believe this structure would indeed read as a church for the culture which created it as well as for all of the western world and even much beyond. The apparent visual languages come from all over the map, well beyond the ghost bike trope. The form is very much of the vernacular American country church. Something of the Spanish colonial churches comes through as well: the rustic version in the proportions and the more elaborate in the filigree compositions. The Gothic certainly comes through strongly, particularly in the conscious ornamentation. But it a reinterpretation more like those of of Viollet-le-Duc and Gaudi. This is more likely incidental resulting from the primary form-generator (that is, scrap bike parts) than a response to historical forms. In fact I would be surprised if any of these historical resonances were intentional references. And that is the beauty of this type of work, whether we decide to call it outsider, folk, vernacular... In this structure we see realized what it seems the church architect cannot. It is what is does and it does what it is without needing to explain to you how and why.